Aahh, the car - what a glorious invention it is. Our lives are simplified and enriched by the empowerment of personal travel. From transporting goods for business to carting 'lil Billy to soccer practice, cars and trucks make our lives much more convenient. With this convenience, though, comes the possibility of tragedy - especially when drivers neglect to practice safe driving techniques. In the wrong hands, a car or truck can cause immense pain and wreak havoc on our lives. With that in mind, Nicolet Service Center urges you to spend some time learning how you can avoid potentially dangerous driving situations so you can keep yourself, your loved ones, and other drivers safe. These tips are proudly brought to you by the entire staff of Nicolet Service Center who wish you and yours safe driving. The professionals at Nicolet Service Center know sometimes you can't avoid accidents, and would rather see you safe then read about you in the paper. Each winter, Wisconsin drivers see the usual snow drifts, jump starts, skids and ice scraps. Don't worry though, with a little preparation you can safely drive your way through another Wisconsin winter (or any winter, for that matter). In some states, traffic is paralyzed by a two-inch snowfall. Business stops, schools close, and life stands still. But not in Wisconsin. Our Department of Transportation has a sophisticated weather tracking and monitoring system that lets county plow crews know what type of storm is on the way and the amount of snow that's likely to fall. Add to that the 1,600 ready-to-roll snowplows and you've got a totally prepared winter fighting force. In fact,Wisconsin is so prepared to clear ice and snow, we rank second in the nation for the fewest work days missed due to winter weather. But being prepared doesn't stop with us. So here are some things you can do to prepared yourself for safe winter driving before the snow falls. As Fall fades to Winter in the Northwoods, people are busy readying themselves for the coming months finishing up yardwork and winterizing the car, hanging Christmas lights and planning holiday menus, tuning up the snowmobiles and putting finishing touches on the ice shack. It's a great time to be living in the Northwoods as the colorful Fall foliage gives way to bare tree branches sagging under the weight of sparkling lily-white snow. The temperature dips and the clear, clean waters of area lakes turn to diamond-hard ice that will serve as simple roadways, connecting opposite lakeshores, until the ice melts back into the Spring-warmed waters. Yes, the Northwoods are a truly beautiful place to call home but people aren't the only residents that are busy bustling about during the Fall - our local deer population is quite active in the later months of the year, as well. 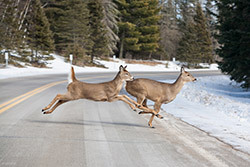 Unfortunately, all of this activity often leads to even more vehicle deer collisions than normal during the Fall and Winter months.